New Rutgers head coach Steve Pikiell talks about the appeal of Rutgers, his first 70 days and his time coaching the Wesleyan Cardinals (NY Post photo). 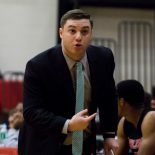 It’s hard to believe it has been a full three years now that I’ve been coaching Division III basketball (first at Bard College and now Wesleyan University), but it was the spring of 2013 that I left Hofstra University after one year as a graduate assistant. Before I ended up accepting a position at Bard, I reached out to countless coaches in the Division I world, seeing if they had any open positions on their staff. As expected, few responded and even fewer had positions available at that point. Something stood out about that search though – my email to Steve Pikiell, at that time the head coach of Stony Brook did not go unanswered. If anyone were to ignore a grad assistant at Hofstra, you’d think it would be the head coach at the other sort-of rival school on Long Island. But not only did Coach Pikiell respond, he did so with a hand written note. He wrote that he unfortunately did not have any positions available, but he hoped I would stay in touch and if there was anything he could do to help, then he would. That really stood out to me in a tough time searching for a job. It was nice to know that someone at a very high level in this business was such a good person. So when Coach Pikiell accepted the head coaching position at Rutgers this offseason, I wanted to congratulate him. I wrote him a note, threw in my business card and expected nothing back – he had just accepted a high major job and was in the middle of a huge transition. But here’s the thing, Pikiell did respond. He called me on my cell phone and wrote me another hand written note. It’s very easy to say that one day I hope to reach the level that Coach Pikiell has, as the head coach of a Big Ten team. More than that though, if I reach the level Coach Pikiell is at, I aim to have the same selfless and generous attitude towards young coaches in the business looking for guidance or advice or a chance. I was lucky enough to head down to Rutgers last week to check out the Scarlet Knights’ facility and speak with Coach Pikiell, one of the best guys in not just the business but in general, about his transition to Rutgers, his time coaching at Wesleyan University and why he’s so good to young coaches like me. Coach Sass: So my first question is maybe a really simple one for you Coach, but you guys were having an unbelievable run at Stony Brook – five straight 20 win seasons, six of the last seven, five of the last six America East Tournament finals. Why leave something so established for something that has been less successful in [Rutgers] a program that has not made the NCAA Tournament since 1991? Coach Pikiell: I loved my time at Stony Brook and a big part of the reason I went there was the people that surrounded the program and the leadership, and I really felt like we had the same kind of leadership here at Rutgers. The people I met, I try to make great decisions about the people that are involved in the program and I felt Pat Hobbs is as good an athletic director and had a great vision. [Hobbs] also understood the obstacles that were ahead and had a really good understanding of college basketball and I also felt like he embraced the challenge along with me. I thought, first and foremost, this is a great institution. Academically, we have a tremendous amount to sell. Secondly, we play in a great conference and thirdly, great people here. That combination really excited me, and the challenge of turning around another program, which I’ve kind of done at a lot of the stops I’ve been at, really excited me. It was great timing. I think timing is everything and I was fortunate enough to get this opportunity and we’re going to work very hard to change what has been the narrative of Rutgers basketball. Sass: You mentioned turning around programs and at Stony Brook there’s been so much success as of late, that people may forget that the first couple years were pretty rough. I think you won like 27 of the first 87 games or something like that [Ed’s Note: Actually 20 of 87] and went 9 and 39 in conference the first three seasons. How does that rebuilding task compare to what you potentially see here? Pikiell: There are a lot of similarities. It’s a big state University with a great academic reputation. Things at Stony Brook take time and things at Rutgers take time when you’re building a program. I really believe that whenever you takeover a program that hasn’t had a lot of success, it all starts, again, with the people and then it starts with your staff. Who are you going to hire in the building process? Who are you going to hire and surround yourself with? I think we started that process, hiring as good of a staff to service our student-athletes as possible. The student-athletes in the program are next. Are we going to develop them and make them better and help them strive for the goals that they’ve set for themselves both academically and basketball-wise? There were a lot of similarities and I played at the University of Connecticut and I was part of that process where Jim Calhoun built that program, I was there year one. I think I have a unique resume, in that I lived it as a player and then I got a chance to coach with him so I saw it as a coach too, the build. All the stops along the way I’ve overcome and you surround yourself with good people and embrace the challenge and certainly we are going to do that here, as did at Stony Brook. It didn’t start off that way and people always talk about those first few years, but we established a foundation during those years. We did a lot of good things. It didn’t show up in our record and that’s what people only count, how many wins and how many losses. We were graduating players, staying out of trouble, we were more competitive on the court, statistics showed that. It didn’t show up in wins and losses until a little bit later down the road, but what was established those first few years were very important for that program moving forward and I think we did a good job with that. But if you only measure things with wins and losses then you can say those first couple years were not successes, and I’m going to argue that they laid the foundation for what the next seven or eight years were going to be like at Stony Brook and those were great years. Sass: I think a big part of building a foundation at any school, whether it’s a school you’re coming into that has a lot of established success in the past few years or a school that you’re rebuilding, is certainly recruiting. Recruiting is certainly the lifeblood of this sport and you were able to come in, your new staff and get a commitment from a very good player, in my opinion, from within the stae of New Jersey. That was the first Rutgers commitment from New Jersey since Myles Mack in 2011, which I was a little shocked when I saw. You have a history of recruiting Jersey, obviously Jameel Warney was great for you, Bryan Dougher, who’s on your staff now at Rutgers was a New Jersey guy and even back at George Washington you got Pops Mensah-Bonsu. How aggressive is your plan to keep guys inside the state? Pikiell: First and foremost, the most important recruiting goes on with your current roster, so I really want to start with that. These kids are part of this program already and they’re the most important kids, so the first recruiting process was to recruit them and make sure they are doing all the right things to get better and represent our program the right way, but also know that we’re hiring a staff and I’m a head coach that’s really excited about them. Then your next step is to go out anywhere you have to go to recruit good players and get them to believe in the mission and get them to believe in Rutgers. I want to recruit those kids in state, obviously it’s a great state and secondly there’s a lot of great programs and great coaches, but Rutgers, in the league that we play in is a national University with great diversity here. So we can go everywhere to recruit and we’re close to hotbeds in Philadelphia and New York City and Connecticut and New Jersey too are great states that produce a lot of good basketball players. Recruiting is always very important and how you do it, but I wanted to first start by recruiting the players in the program and secondly get out as much as we can and see all the players in the Tri-State Area and Philadelphia and DC and we’re close to Baltimore and our reach now in the Big Ten gets everywhere. We can get out in Ohio and Nebraska, because that’s where our league has footprints in. It’s kind of exciting, the recruiting beds that we can stick our nose in now, which Rutgers and the brand can do. Recruiting is a big lifeline, like you said, and you want to always take care of your local talent, but I also want kids that want to be here and are on the same mission we’re on, so if we have to go wherever to get those kids, we’re going to do that. Sass: Speaking of the current players, and even just beyond that, there’s so much more than you could possibly explain in just this answer, but how have you guys tried to come in and transition? Sometimes there’s a lot of upheaval, you see a lot of transfers and it’s been very smooth here, at least from an outside perspective. What have you guys done to try to make that happen? Pikiell: I think there’s always, whenever there’s turnover or change, there’s a lot of unrest between a lot of different parties. But first and foremost, I wanted these guys to know that I’m here and I’m excited about the job and I’m excited about them. I think it takes time to build that trust and we’ve tried to instill that in a short period of time; I think today’s day 70 or something on the job. So you’re trying to do a lot of things in 70 days, travel everywhere you can so you’re out there and being seen, but yet you’re in the office as much as you can, yet you’re out there meeting with alumni groups and student population and do a lot of things. So it takes time to build the trust and I think we’ve been able to do that with our players and I’m excited about it. I think their upsides are terrific and they’re really focusing on working and getting in great shape and I think over time they’re going to see that this staff is there for them. That’s the exciting part for me, because I’ve been able to assemble a great staff that’s going to help them in every way possible and I think they’re going to see that as time moves on. Sass: Let’s slide over to some on the court stuff. The America East has a reputation as a real tough defensive league where you just have to really grind it out and be tougher than the team next to you. You guys were able to find ways to score; Jameel [Warney] certainly was able to put the ball in the basket and other guys too. How do you think basketball-wise, in those 94 feet, what you did at Stony Brook will translate to the Big Ten and how much do you think you’ll have to adjust? Pikiell: I’m really excited; during my time at Stony Brook we’ve won league titles and we’ve won all different ways. So I kind of want to tell you that you’ve got to figure out a way to win with each team and each roster. Some rosters have more big guys, some rosters have more guards, some rosters have injuries and I think we did a really good job each year figuring out how to win with whatever our roster looked like that particular year. I will tell you, one of the constants at Stony Brook from day one is we defended and rebounded. I think that’s going to be a core of what we do here moving forward. We haven’t had that much success in both those areas in the past. It’s obviously a league with Hall of Fame coaches and some really terrific programs, so if you do those two things that gives you a chance and you figure out your offensive strengths and play to those. But I really like our roster and our ability to get up and down the court. I think this roster is built to run and play like I want to play, and that will be fun. Always, again, at Stony Brook, it was different. Our strength these past couple years has been throwing the ball into the post, so we spent a lot of time in that area at Stony Brook University doing that. I think we always did a good job of playing to our strengths and we’re going to figure out what our strengths are here, we’re going to defend and rebound and hopefully that puts us in position to compete and if we compete we’ve got to figure out a way to win games. I think that formula will work too. It’s a great league and most of the teams at the top of this league do that too and have NBA draft picks, so we’ve got to try to make sure we can develop some of these guys into NBA draft picks. We’ve got some very talented guys on this roster that I’m very excited about. Sass: It’s not just men’s basketball, but the other premier sport, football, made a coaching change as well at the top. Chris Ash came in from Ohio State and like I told you before, I’m a big Ohio State football fan and a believer in what Urban Meyer has done. What has your experience been with having Chris on campus and going forward with what I assume are very similar missions? Pikiell: Having Chris here has been tremendous. He’s six months ahead of me in the process and he’s done just an unbelievable job. The first time I talked to him I knew how enthusiastic he was. I said that I could see why players want to play for him. He’s a player’s coach and a diligent worker and he’s going to do a great job, obviously with football. I look forward to being his biggest fan and we’ll certainly be at football games and official visits and have recruits there. It makes our program a little bit unique. There’s not a lot of football teams that are in big time conferences in this area, so it makes Rutgers a little bit unique in that way, that we’re in a Power 5 conference and play major college football. I’m excited about that and I’m excited about watching his program grow and trying to steal some ideas from him. Sass: I know that you’re a Connecticut guys with deep roots there. Two-time captain for the University of Connecticut and I think a lot of people know that you’ve coached all over the state. You’ve spent a couple years at Yale, Central Connecticut, UConn, but a lot of people don’t necessarily know that you spent a year as the head coach at Wesleyan, where I’m at right now. So I’m kind of curious how that came about? Pikiell: You know what, that was one of the greatest things I did. I got a chance to be a young head coach and you always think it’s easy, until you become the head coach and you realize how difficult it is. I was at Yale University and I got a phone call asking, ‘Would I mind being the interim head coach?’ At the time, I really didn’t want to leave a great position at Yale when I knew it was just an interim position and they were going to go to a national search. I spent some time with Tom Beckett, the athletic director at Yale, and he was able to work it out that I would leave Yale on sabbatical to take an interim coaching position, so I really felt like I had the best of both worlds. I was going to get some head coaching experience, coach some great kids and yet at the end of the year, if they decided to go in a different direction, I’d have my opportunity to go back to Yale University, which is kind of unheard of. I really, really enjoyed my year at Wesleyan and I thought we did an unbelievable job of recruiting. That’s how I got to know Coach Reilly, we were assistants together at Yale. I got to learn for a year, what a special place and the NESCAC, what a great conference, meet a lot of people and also learn at that time, how hard it was to be a head coach. I think it made me a better assistant moving forward and made me a better head coach. We were able to recruit some really good players that went on to have great careers at Wesleyan. I’m still in touch with those guys to this day. Josh Meyer is up at St. Mike’s and he’s the head coach there and Sean O’Brien was a great player, he’s in the record book, from Bristol, Connecticut. Matt Kingsley and I are good friends, I got to coach him a year at Wesleyan, so great experience. Another place with great people, a great university academically, it was a fun year for me and it was a great year for me to really learn basketball as a head coach and learn how difficult it was. Sass: The craziest thing I saw though, is that Wesleyan wasn’t even the most unique stop on your coaching journey. That was the New Haven Nighthawks of the USBL. What was that like? Pikiell: That was another great learning experience. I had just finished playing at Connecticut and I got a phone call from Terry O’Connor who was the head coach, he now does radio. He needed an assistant coach and it was a six-week kind of thing. I went down there and I worked with pro players, guys that got drafted and got paid to play. Travelled all over the place and played some really, really good professional basketball to see how different that shot clock is and philosophies and that stuff. So all these stops along the way were great learning experiences and that certainly was one of them. Sass: I mentioned this to you and I’m incredibly grateful for all the time you’ve given me. When I left Hofstra you took the time to write me a note and wish me the best of luck and offer whatever help you could. You mentioned you’re not even 70 days into this new, enormous job and you’re taking time to talk to a young, Division III assistant and I’m sure you’re doing it for other guys too. Why are you willing to do that? Pikiell: Honestly, I was a Division III coach. I was at Yale, I was at a lot of different stops calling people or sending out resumes and I heard back from a few and didn’t hear back from many more. So I really said, if I ever get myself in a position to have any influence and that people would want to work for me, I would always try to do a really good job of reaching back out. It’s tough decisions as a coach, who you hire and there’s a lot of people you don’t hire or can’t hire and they would all be good choices. But any advice I can give people trying to break into the business or trying to be Division I or Division II or Division III or USBL coaches, that kind of thing, I enjoy doing it and I take that responsibility personally and hope I can help some people out moving forward with just some advice or just trying to do things the right way. I was taught by a lot of different coaches to try to be true to yourself and do things the right way and I think that’s the way I’ve always done things and I try to do that with that philosophy moving forward. Sass: You have on your staff Bryan Dougher who played for you, Coach Hobbs who you worked with at George Washington, Coach Young who was at Stony Brook with you. You seem like a very loyal guy in terms of guys that you have connections with. How did you assemble this staff? Pikiell: A lot of thought went into it. It was very hard, they all had to move, they all gave up pretty good positions where they were, great positions for some of them. When I assemble a staff, and I told you the first part of building a program is that, first I want great people and I think they’re all great people. Secondly, they all fill a skill set that I needed or we needed here and they all bring a different set of strengths to the position. I’ve been very fortunate they all said yes and they were all my number one choices. They come here and bring that skill set which is going to help build this program. I’m just blessed that they came on and jumped on this journey with me. Like I said to you first, character counts, and I think they’re all great character people and I feel very confident we’re going to move this program forward because of that. This entry was posted on June 21, 2016 by Coach Sass in Coaching, College Basketball, The Presser (Interviews).